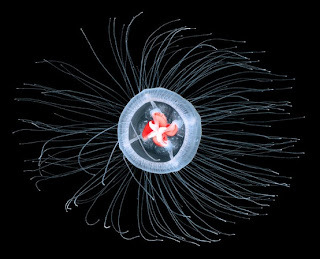 On November 28, 2012, The New York Times published a long and very interesting article about the "immortal jellyfish" (pictured). 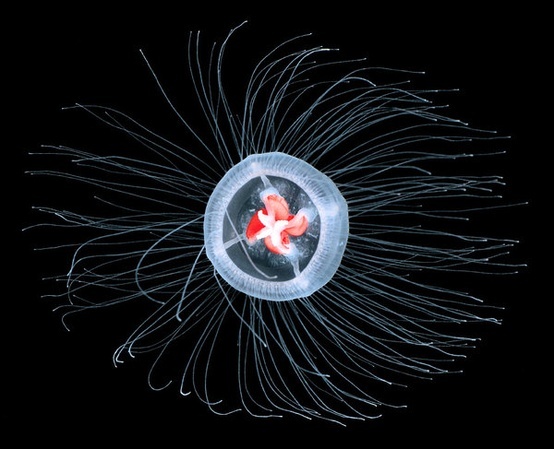 The scientific name of this amazing creature is Turritopsis dohrnii. Shin Kubota is one of the scientists studying the jellyfish. He is hoping to find the secret of immortality soon, and to become immortal himself. Query whether this would really be a very good thing! Kubota, in fact, also has some qualms about the prospect of human immortality. "Before we achieve immortality,” he said, “we must evolve first. The heart is not good ... Human beings must learn to love nature." Learning to "love nature" is definitely a good idea, as far as I am concerned. No qualms about that! What I have noticed about nature, however, is that individuals don't live forever. You and I come, and then we go, and life goes on. In fact, it doesn't seem that the so-called "immortal jellyfish" is any different. At least that's the way I read the article. Trying to live forever? That's a dubious proposition, in my opinion. Trying to live right? That's worth some effort!